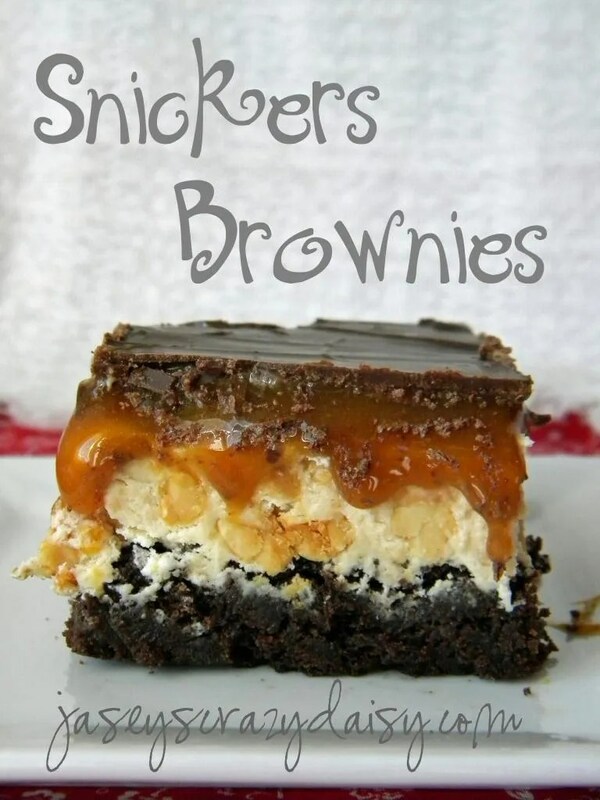 Brownies, obviously I have a thing for brownies, but how could I resist Snickers Brownies? I guess I have a thing for taking my favorite treats and twisting them into brownies. This time brownies collide with everyone’s favorite Snickers candy bars, complete with, peanut nougat center, caramel, and chocolate candy bar topping. Go ahead and make them now, you can thank me later. OMG those look good. I love that you made your own nougat layer. Yum! OK YUM! These look amazing! My favorite part is the nougat layer. Have to try these! OH MY! These look fantabulous! I am not good with baking, so I am forwarding this recipe to my baker friend, Becky, so she can make them for me! Good GOLLY! These look absolutely incredible! I have a serious things for Snickers, so these are definitely going on the “must try” list! I’d LOVE it if you’d share this at Feature Friday FREE-FOR-ALL…going on right now! These have to be the most decadent brownies ever! WOW! Thanks for sharing your recipe. Just one question– what size pan do you make these in? I use a 9×13-in baking dish. Sorry about that! Have a great day. I’ve been making these for years. Always a hit. I found your blog through pinterest (this recipe) and made them last night for some missionaries. HUGE success! Everyone had seconds and raved while they were eating each gooey bite. Thanks for the recipe and I can’t wait to try some of the other sinfully delicious looking recipes you have listed. Thanks, Marci, for your words of encouragement! I am so glad you have found recipes you and yours enjoy here at JCD! These look absolute delicious! I am thinking about trying out this recipe I just have a few questions. These look like they may be a little bit messy. Is this something you have to eat with a fork? What kind of a pan did you use… I usually just use a 9×13 pan. I will edit the directions now so they are more clear. umm It was 9×9 so they came out thick and gooey but OMG are they awesome! My 4 yr old could care less that they are a little sloppy, it gives us an excuse to make them again 🙂 It just barely spilt over the top-no worries they are yummy! Thanks so much-Im busy pinning a bunch more of your recipes now they look so good! I am so glad they turned out and you enjoyed them :)! I am thrilled to hear that you are finding other recipes to try! Have a great day! These look amazing! Im going to grab the supplies to make these at the store tomorrow. Heres hoping the I don’t eat the whole batch myself! I plan on giving these a go this afternoon, Just one question… Do you add the ice cream fudge topping to the brownie batter, or as a layer on top once the brownies have baked? Question: Did you use a family sized box of brownie mix or a regular size? This is so creative! I cannot wait to try these out, they look absolutely delightful! can you substitute extra crunchy peanut butter for the peanuts? Jan – I used both crunchy peanut butter and peanuts. I don’t think it would be as good w/o the peanuts, but I’m sure you can skip them. Has anyone split the recipe into 2 8×8 pans instead of one 9×13? I want to give it away, but 1/2 a batch will be plenty to share… it’s so rich! I made these yesterday and they were delicious. However, the nougat oozed out and they lost their shape and they were a mess. Is there a way to ensure that they stay together? Did you serve them chilled? I cut them and then left them out. Should I have kept them in the fridge? Really, that’s up to your preference. I would definitely chill them before cutting though. I like to store them in the fridge and cut as needed. Is it normal for the browine portion to be so thick? I did not have any room to add all the layers on, so i had to move to a deeper pan. Is this norm? Did you use a 9×13 pan? Looks delicious. Will definitely be trying these! I just found your link and made 4 of your recipes last night. Everything turned out awesome. Everyone loved the brownies and brought some to my work at the fire station. Thanks for sharing! :)You made my day, Paula! Which other recipes did you try? So glad you enjoyed them! This is, without a doubt, the best thing I’ve ever put in my mouth. And I’m a pastry chef. WOW. It would be impossible to oversell this dessert. The only thing I changed was to make my favorite brownies for the base (Best Brownies from allrecipes.com). This is out-of-control delicious! I made these Brownie and became the talk of the town. Sending all the credit your way! Everyone LOVES them – Great JOB!!!!! Made a batch of these for my sister as a welcome present for their family and the birth of their son. She has always loved Snickers, and though I’m not supposed to eat treats and was never as much of a Snickers fan, I have to say, after sampling one (ok, maybe two :)) I can attest to the fact that these are DELICIOUS and, unlike other recipes I’ve been using lately, do not fall short on their promise to taste like Snickers! These taste exactly like Snickers! Make them, it’s fun. Congratulations to the cook who developed this recipe, you are a genius! Made these for a tail gating party this past Sunday and every body loved them! I only had one issue and that was getting the chips and peanut butter to melt enough to spread nicely! The nouget layer made the brownies…YUMMY! Thanks for a great recipe! Sorry.. Since the end of August. They are going to be so excited. It took me clicking 5 pins that all resulted in spam before I finally found the correct one. Thanks so much. I will let u know how it goes Friday. Any suggestions for a Milky Way version? I’m just not a fan of peanut butter (gasp) so I’m wondering how badly it would screw it up to leave it out. I made these for a pot luck yesterday and they were AMAZING!! Thanks! Christmas Eve will never be the same after we have these. My son has been bugging me to make these again, since I made these for him last year! They were absolutely amazing and we are going to make them again tomorrow. Thank you so much for sharing.. Thanks, Stephanie, for your reply, I thought I had left one. Maybe I emailed it. Anyways, yes, my thoughts would also be to make sure the mixture isn’t boiled for too long. You can totally take it off the burner/heat once it boils and stir everything together, if you have a hard time getting things to incorporate and melt, you could always return it to low heat just until melted.Hope that helps, I haven’t had this problem and haven’t had any other complaints that I know of – darn it! Make sure you don’t over cook the nougat layer. I removed the pan from the heat right after I added the marshmallow crème and then stir in peanut butter and vanilla. Also if you bring mixture to a boil to fast the sugar won’t dissolve enough. Good luck. Hope this helps. Thanks to you Jasey for great recipe!! We love these. Is marshmallow creme Fluff or marshmallow ice cream topping? Also, my box of brownies says to use 2 boxes of mix for a 13 x 9 pan. Is this correct? I made these the first time (And they are DELICIOUS by the way!!) however the nougat and caramel layers did not hold their form. Have you had this experience? Did I botch something?